Posted October 13, 2017 by The Rapid & filed under Silver Line. Michigan’s first bus rapid transit (BRT) line, currently known as the Silver Line, may be in for a name change. As of June 28, 2017, The Rapid Board approved selling the naming rights of the Silver Line as a fiscally responsible opportunity for partnership within the community. Why now for the Silver Line? And what does selling naming rights entail? Essentially, The Rapid would offer to rename the Silver Line based on an advertising partnership. Typically, naming rights partnerships offer a huge return on advertising dollars that is far above what can be achieved through traditional marketing channels. The Rapid provided approximately 808,000 rides to passengers this past year on the Silver Line, so the visibility of the Silver Line route is enormous. “Teaming with The Rapid also demonstrates that a company is committed to our community and a recognition that everybody in Grand Rapids wins with a strong public transportation system, even if you never ride the bus,” said Michael Bulthuis, Marketing and Communications Manager of The Rapid. The Silver Line launched in 2014 and was under budget and ahead of schedule. The capital cost of the Silver Line was $40 million, which came from a mix of state and federal grants. 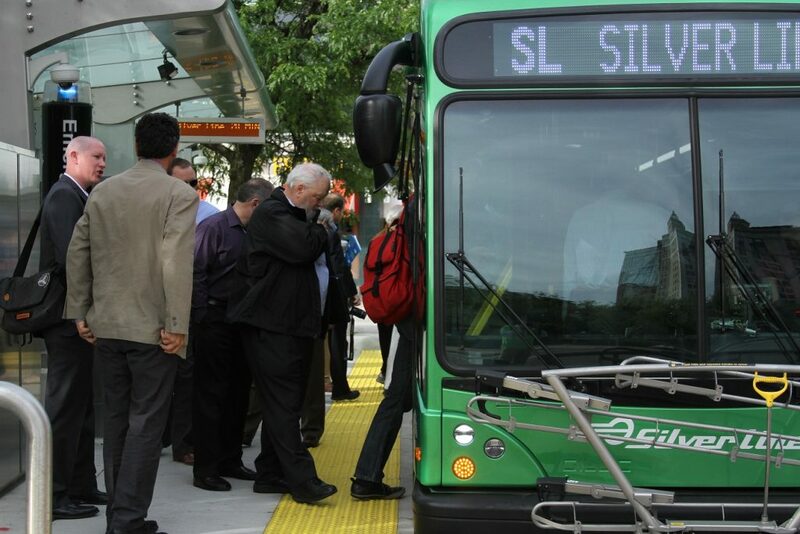 Operational expenses for the Silver Line are covered through a portion of the millage collected from the six cities The Rapid serves, as well as fares and state operating assistance. At The Rapid, we’re not only focused on safety and customer service for our passengers; we’re also committed to strong financial stewardship to the public that funds our system. Opening up naming rights on the Silver Line helps ensure we don’t have to raise fares or raise property tax rates. This is also why we’re committed to asking for a renewal of our currently operating millage on Nov. 7, 2017. While the Silver Line may be the first BRT in Michigan, it’s not the first transit system in the US to sell naming rights sponsorships to its assets. Public transportation agencies across the country routinely explore this option as a way to offset growing capital and operating expenses. “We truly see this as a win-win-win opportunity for The Rapid, the public and a private entity that wants to help promote the benefits of public transportation while demonstrating their dedication to Greater Grand Rapids,” Bulthuis said.